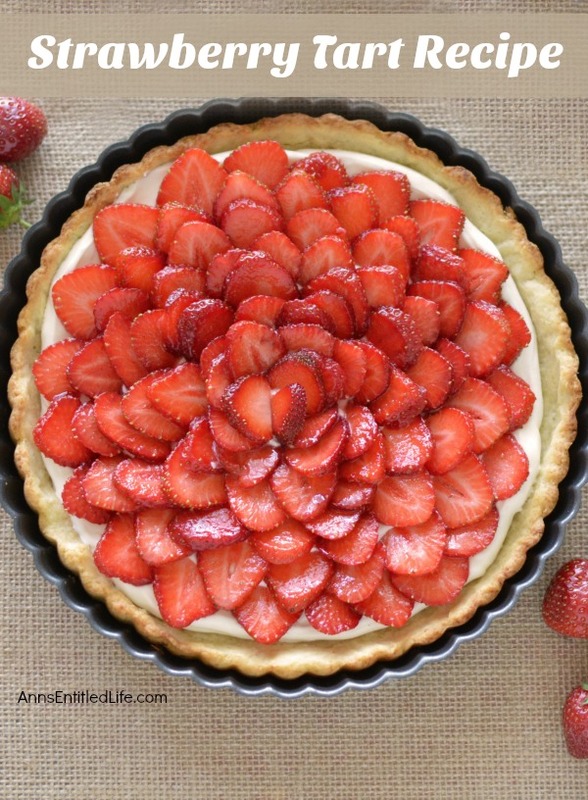 A visually stunning presentation, this strawberry tart is actually simple to make. 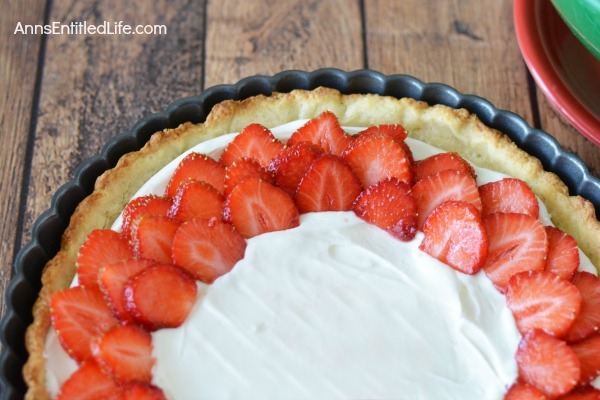 Make this strawberry tart for dessert, to take to a party, serve with tea or for anytime really. Your friends and family will be impressed. 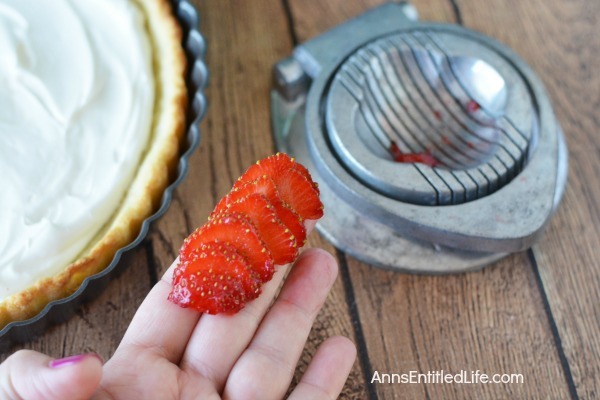 Only you will know how truly easy this strawberry tart recipe is to prepare! • Add cold, cubed butter and flour to a food processor. Process for about 30 seconds until butter is well mixed with flour. • Add beaten egg yolk along with 1 tablespoon water to the mixture in the food processor. Process for 30 seconds and add additional water, 1 tablespoon at a time, until the dough forms. • You may need 4 tablespoons of water instead of the 3 tablespoons listed. Check your dough before adding that 4th tablespoon though. How do you know when the dough is ready? It sticks to the sides and under the blade and you can hear your food processor “struggle”. You then know it is time to turn the food processor off and peal out the dough. 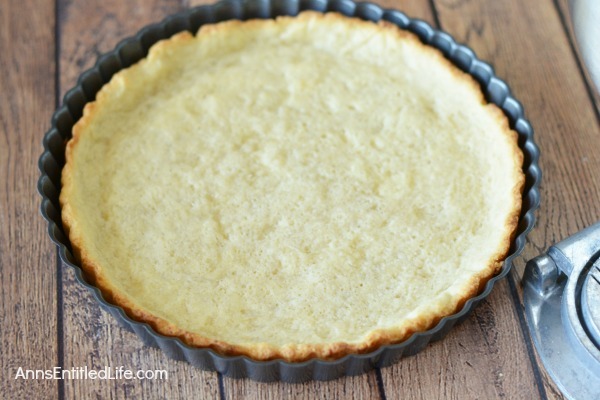 • Press pastry into a 10″ tart pan. • Place a double layer of aluminum foil over the dough to prevent shrinking while baking. • Bake for 8 minutes at 450°. Remove foil and bake for another 4-5 minutes or until set and dry. • Remove crust from oven. Allow to cool completely. • Using a stand mixer, add cream cheese to a mixer bowl and beat for 1 minute or until smooth. • Add sugar to cream cheese and beat until combined. • Add whipping cream to cream cheese mixture; beat for 2 minutes, scraping down sides half way through. 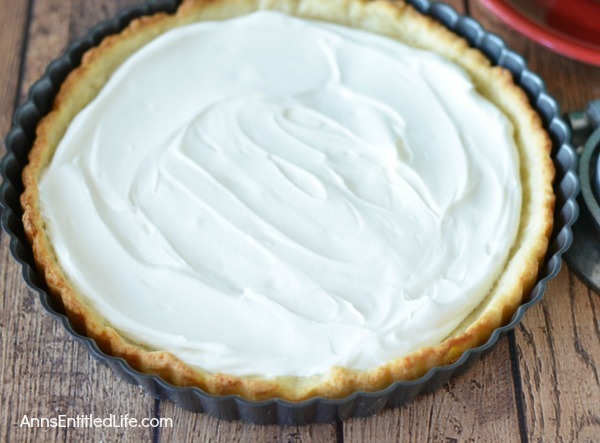 • Spread cream evenly onto cooled tart crust. 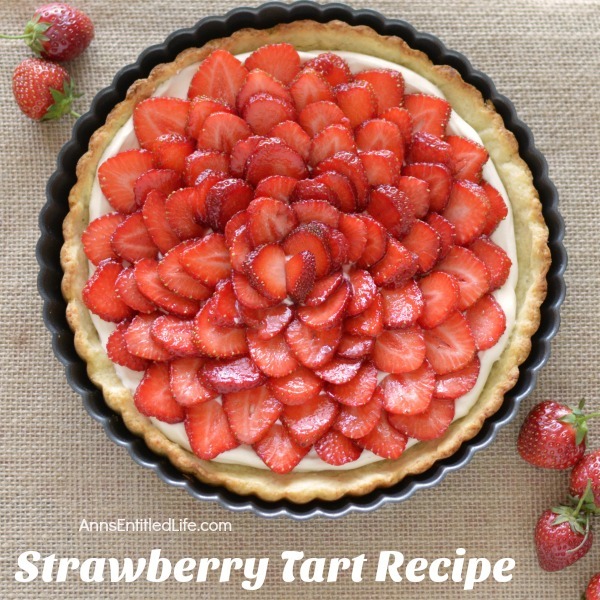 • Top cream on tart with sliced berries starting from the outside and moving in. Looking for a dessert that looks like you put a ton of time of effort into it, but is actually very easy to make? 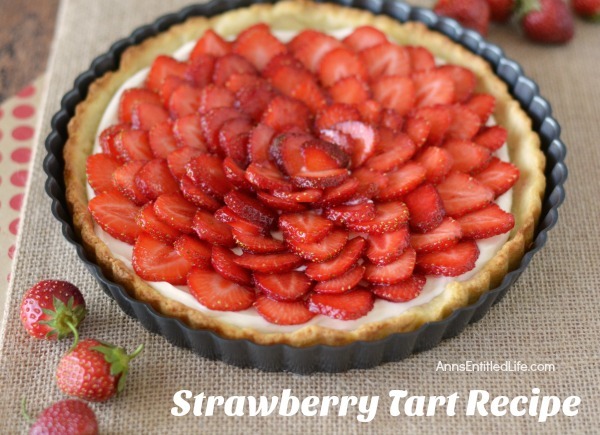 This strawberry tart is beautiful. Simply beautiful. And easy to make. 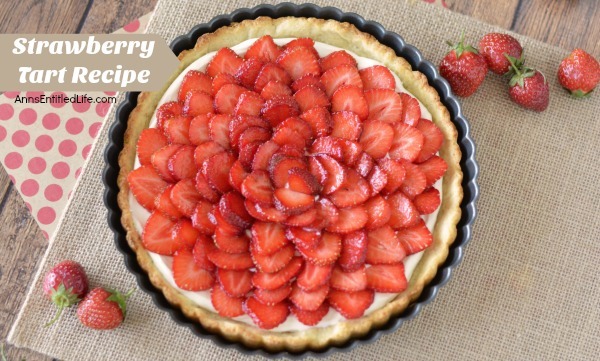 The next time you are looking to impress friends and family – or just want a delicious sweet berry treat – give this strawberry tart recipe a try! • Add butter and flour to a food processor. Process for about 30 seconds until butter is well mixed with flour. 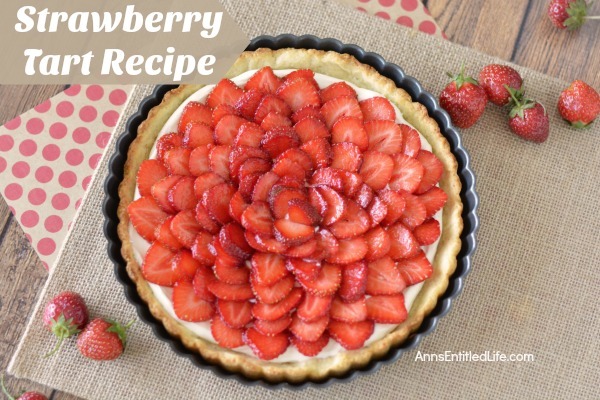 • To print the Strawberry Tart recipe, click here. Wow, looks so easy to make but pretty! I will be making this one gluten free. Thanks for the recipe! Ann, you are a fabulous cook! This tart is so pretty! Thanks for linkin’ up with What’s Cookin’ Wednesday! Oh my! This looks absolutely amazing! Thanks for linking up with the Delicious Dishes Recipe party this week!